The Rock Solid Articulating Arm is designed to hold a variety of devices including iPads, tablets, phones, and other lightweight fixtures solidly in place. The Rock Solid 7″ and 11″ Articulating Arms are designed to hold a variety of devices including iPads, tablets, phones, and other lightweight fixtures solidly in place. Easy to adjust and maneuver, simply turn the single knob to release all of the articulating joints and adjust to the new desired position or angle. The sturdy elbow design features a locking lever control at the pivot. The arm includes two fully articulating joints at both ends and will hold any fixture up to 4.5 lbs. The 1/4″-20 male threads on both ends of the arm enable a connection to any device with a 1/4″-20 female receptor. 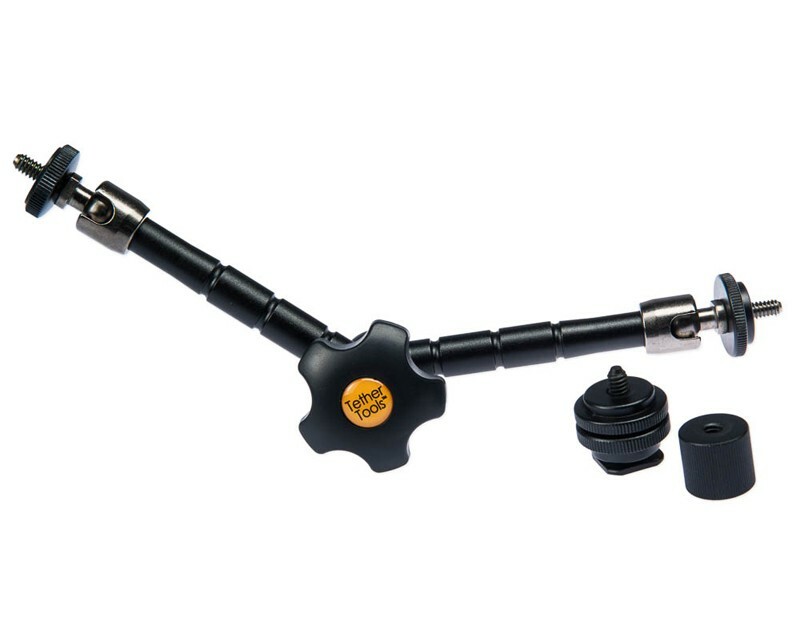 Both the 7″ and 11″ articulating arms are sold with a removable hot shoe adapter for camera mounting. Constructed entirely of aerospace aluminum, the Rock Solid Articulating Arm comes with the Tether Tools Lifetime Warranty. Holds devices or fixtures up to 4.5 lbs.